Johnny Gustafson played with Roxy Music on their 'Stranded, Country Life' and 'Siren albums as well as on Bryan Ferry's 'Let's Stick Together' album. His most famous bass line will undoubtedly be Love Is The Drug. John "Gus" Gustafson also known as Johnny Gustafson (8 August 1942 – 12 September 2014), was an English bass guitar player and singer, who had a lengthy recording and live performance career. Born in Liverpool, he is known for his work with 1960s bands The Big Three and The Merseybeats, and for singing on the original recording of Jesus Christ Superstar as Simon Zealotes. He made an appearance on Roger Glover's The Butterfly Ball and the Grasshopper's Feast album track, "Watch Out for the Bat Now", as a vocalist. 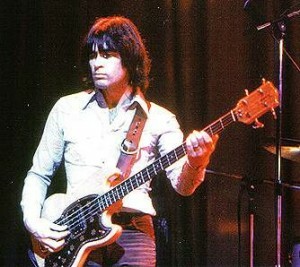 He is probably best known for playing bass guitar for several re-incarnations of the Ian Gillan Band and for his earlier participation in the progressive rock band, Quatermass. He also re-formed The Pirates, originally the backing band for Johnny Kidd.